This picture does not belong to the seven levels. It should give therefore an idea about having an access to the circle as this world view has also a scientific character. Scientific studies usually start with the setting of tasks. But scientific work with the aim to cross boundaries cannot always be done by following rules. Following rules implies linear thinking. Linear thinking limits the mental horizon without any needs which leads to the option to get lost in details and prohibits a global view. At the beginning was an unspecific discomfort about the economic and social rules. This discomfort became more and more specific during the process of knowledge gaining. Random hypotheses and pre-judices were the result. Pre-judices are judgements without a rational proof but they must not be wrong. By systematic and scientific analyses the statements became increasingly concrete. This process is symbolised by sentences which are placed criss-cross and highlighted yellow. 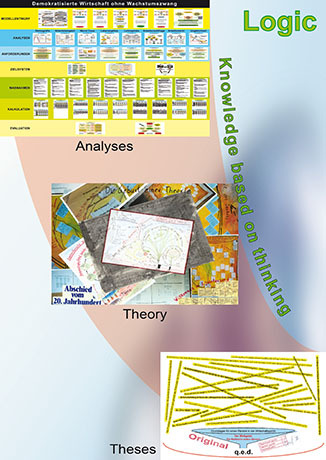 Then theories are helpful to filter the statements which can be structured further by using the methods of the system theory. Furthermore mathematical and logical models can verify and falsify the hypotheses. The actual situation of the society shows that there are needs for actions. Examples are the high unemployment rate, the youth without any perspectives, the neglect of the educational system and the expansion of slums in the suburbs. This might be caused by declining economic growth and increasing labour productivity rates. The solution is to establish incentives to reduce the hours worked and to increase the wages. The acceptance of the actual circumstances by resignation - and the chances are good that this succeeds as the stupefaction of the people by establishing a mass culture of primitivity might win. The rebellion of the underdogs who have nothing to lose anymore if the pressure to improve the social conditions is not answered adequately. A change of perspective by introducing suitable economic measures such as reducing the hours worked and increasing the wages. You can find the proposed economic system under: "Studies of Economic Change". innovations causes unemployment - but: innovations contribute to international competition.